At Konversations, we always want you to keep learning and improving. 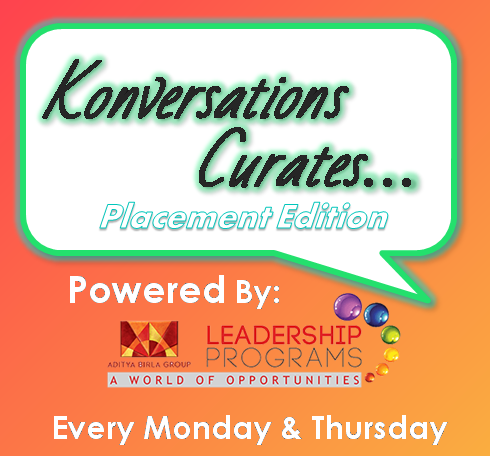 Speaking of, we bring you Konversations #Curates – The Placement Edition in association with ABGLP. In this special series, we focus on the #placement season, with some special resources to help you. We know that you have worked hard over the years to reach the level where you have. While getting a great job is far from the finish line, why hold back right now? One article around the interview process. One article on current affairs that can come up in the selection process. One article on a great case study you can refer to during your interview/GD. One article on helping you choose the ideal job. Here is the next installment of Konversations Curates – Placement Edition! 1. Sometimes, interviews can be really short. Like really. So how do you make a powerful first and final impression? Well, here’s how. 3. The Budget Bag is a tradition. In the parliament of India. What is the Budget Bag? Get a history lesson, a low down on some of the processes that go into making the budget, and some trivia about budget bags and Halwa here, just in case you must need to prove to your interviewers you know much about union budgets! 4. A Starbucks at every corner sounds normal right? But in 2008, Starbucks decided to close 600 stores in the USA. Because strategy. The company was growing. But brand value was diminishing. What did Starbucks do to correct this imbalance? Find out in this GD worthy case study. Want to read more such stories and excel during placements? Check out the previous editions here.